Foundations exist to keep homes exactly where they were built, not lower or higher or tilted to one side. Everything else a foundation offers, such as storage or additional living space, is a bonus. Homes have four general foundation types. Pier foundations are similar to the supports for free-standing decks. Slab foundations consist of a poured concrete slab sitting directly on the ground. Crawl space foundations have short walls that support the subfloor several feet above the ground. Basement foundations consist of full-height walls supporting the subfloor. To determine which is right for your situation, let’s travel back in time and see why they were created in the first place. A long ago in a land far away, a pioneer, tired of living in a cold damp cave, took up his ax and headed for the forest. He swiftly felled some trees and arranged them on the ground. Stacking the logs into walls and adding exposed beams to support a roof, he created a comfortable home for himself and Mrs. Pioneer. He felled more trees. This time, instead of setting the sill logs directly on the ground, he gathered some flat rocks, arranged them in stacks and laid the sill logs across them to support the floor and log walls. Thus, the pier foundation was invented. Piers worked much better. Seeing the success of the Pioneers, others left their caves and joined them. 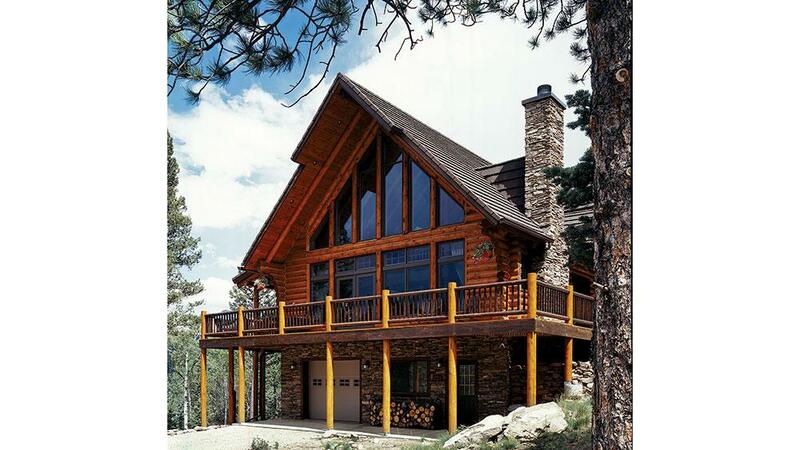 They, too, liked the look of logs and built their own log homes in the same manner. With a keen interest in log construction, Mr. Pioneer watched and over time noticed some things. While rock piers created a solid base on hard, stable soil, they were less than ideal when ground was soft or soil conditions poor. In some places, piers sank into the ground, leaving logs sitting directly on the soil again. Sometimes, piers sank at one corner, leaving the opposite corner suspended in space, until it eventually drooped, leaving a nasty wrinkle in the floor. In high winds and earthquakes, piers proved useless in keeping homes attached to the earth. “I think my pier foundation needs some tweaking,” thought Mr. Pioneer. He had noticed that even when conditions were good, floors and walls sometimes still misbehaved. He also noticed that ground expanded and contracted as it froze and thawed. He advised his new neighbors to dig holes for their piers that went below where the ground usually froze. Placing rock piers below frost depth further reduced shifting and settling of people’s homes. “One day, someone will invent building codes, and you’ll have to do this anyway,” Mr. Pioneer told them. The crawl space not only made it harder for skunks, raccoons, opossums and bears to take up residence under their log home, but also helped insulate the floor against winter’s cold. But there were still some issues. The crawl space had a dirt floor, and moisture from the ground sometimes threatened to rot the floor. Mr. Pioneer considered inventing pressure-treated lumber and wood preservatives but realized he would have to invent too much other stuff first, so he looked for a simpler solution. He tried ventilating the crawl space by leaving some holes in the rock wall above ground level. This was also an open invitation to many of the critters he had just excluded, so he invented screens to cover the vents. They stopped the critters, but since outside air now circulated under the house, the floors got pretty cold in winter. About this time, a clever neighbor invented concrete, and Mr. Pioneer quickly saw its potential. “Why not just pour this stuff on flat ground and skip the piers and crawl spaces altogether?” he asked. People really liked slabs because they saved a lot of digging and rock stacking. This made construction faster and less expensive. But folks living in cold climates still had problems. Freezing and thawing caused the concrete slabs to buckle, and walking barefoot in winter wasn’t for the faint-hearted. It worked, and the monolithic slab was born. It worked well in many situations but wasn’t right for everyone. Slabs needed fairly flat ground. In colder climates, the trench around the edge had to be deep, requiring a lot of digging and, more importantly, a lot of expensive concrete. In these circumstances, it looked like piers or vented crawl spaces were better choices. Of course, these choices brought back cold floors, occasional shifting or sinking foundations and potential moisture damage. “I’m working on it,” responded Mr. Pioneer. So, over the space of a few thousand years, the basic types of foundation were invented to fit all kinds of environments and building conditions. At this point, you might think the story ends. Far from it. The principle of the FPSF is simple. Insulating the edge of the slab and footing and the ground immediately around the foundation captures heat from the building, so frost doesn’t penetrate as deep. Footings built this way need be only 12 to 16 inches deep instead of several feet. The result is considerable savings in both time and cost. Because an FPSF relies on building heat, indoor temperatures shouldn’t be allowed to drop below 55 to 60 degrees. This means they aren’t suitable for unconditioned outbuildings or seasonal homes. The amount of insulation and the width and depth of insulation laid around the footing depend on the climate, so it’s important that someone familiar with FPSFs design them. It’s also best to have them installed by an experienced contractor. It will be less expensive, plus you won’t have to listen to all the reasons you should be building a traditional footing. ICFs are panels or blocks made of rigid foam insulation. Instead of erecting forms, pouring concrete and then stripping away the forms, concrete is poured into the ICFs, which are left in place to create an insulated concrete wall. They result in better energy efficiency and a drier, more comfortable basement. Pre-cast concrete foundation wall panels are set with a crane. They include some insulation and can accept more to make a fast, energy-efficient basement wall. “By the way,” Mr. Pioneer said, “if I planned on a full basement, I would look for a building site with enough slope to leave part of the foundation wall exposed. That way, I could add some windows and maybe a door. Basements are a lot more comfortable when they can get some sunlight and fresh air. With the afternoon wearing on, I finally wrapped up our conversation. As I was walking away, Mr. Pioneer left me with a few parting words. Jim Cooper is a former general contractor, the author of Log Homes Made Easy and a LEED Accredited Professional who consults in energy efficient and sustainable building.